Looking for Easter themed Pre-K centers? Kindergarten centers too? These are for you! 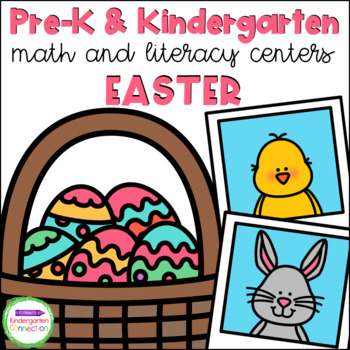 This pack is filled with engaging math and literacy centers for Pre-K and Kindergarten students with an Easter theme, (eggs, jellybeans, chicks, bunnies, etc, see the preview and description below for full details). 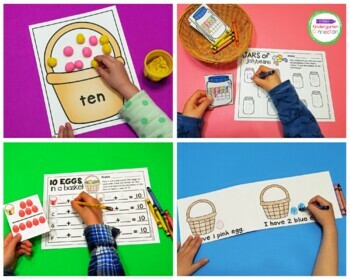 “Counting Easter Eggs” Emergent Reader (2 levels) - print a simple counting version, or one with a predictable sentence pattern and color words. Copy two-sided and cut in half for two books! Hop to It! CVC Words (2 levels) - Pick a bunny card and say the picture name. Find and color a basket with the matching CVC word. (1 set includes the words by the pictures for word matching support). 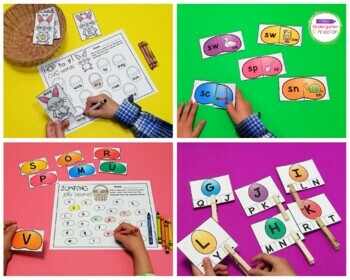 Easter Egg Sight Words (Editable Version Included) – Read the sight words on the baskets and then use the eggs to build them. Beginning Blends Jellybean Puzzles (2 levels) – Match up the pictures to their beginning blend. (S, L, and R blends included – one set includes the blend written on both puzzle halves for matching support). Jellybean Count and Clip - Count the jellybeans in the 10 and 20 frames and clip the total (sets to 20). 10 Eggs in a Basket – Pick a card and count the eggs on each side. Find the letter of that card and record the equation in the box to make a sum of 10. 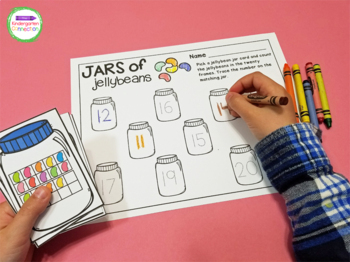 Counting Jellybeans Cards – laminate and use with a dry erase marker. Count the jellybeans and write the total in the box (sets to 12). Adding Easter Eggs Cards – laminate and use with a dry erase marker. Write the equation and solve to show how many Easter eggs (beginning addition to 10). Subtracting Easter Eggs Cards – laminate and use with a dry erase marker. Write the equation and solve to show how many Easter Eggs (beginning subtraction within 10).